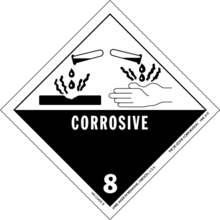 A corrosive substance is one that will destroy and damage other substances with which it comes into contact. It may attack a great variety of materials, including metals and various organic compounds, but people are mostly concerned with its effects on living tissue: it causes chemical burns on contact. The word corrosive is derived from the Latin verb corrodere, which means 'to gnaw', indicating how these substances seem to 'gnaw' their way through flesh or other material. Sometimes the word 'caustic' is used as a synonym but 'caustic' generally refers only to strong bases, particularly alkalis, and not to acids, oxidizers, or other non-alkaline corrosives. Corrosives are different from poisons in that corrosives are immediately dangerous to the tissues they contact, whereas poisons may have systemic toxic effects that require time to become evident. Colloquially, corrosives may be called "poisons" but the concepts are technically distinct. However, there is nothing which precludes a corrosive from being a poison; there are substances that are both corrosives and poisons. Their action on living tissue (e.g. skin, flesh and cornea) is mainly based on acid-base reactions of amide hydrolysis, ester hydrolysis and protein denaturation. Proteins (chemically composed of amide bonds) are destroyed via amide hydrolysis while lipids (many of which have ester bonds) are decomposed by ester hydrolysis. 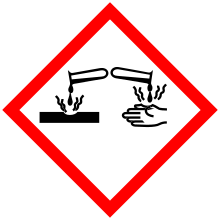 These reactions lead to chemical burns and are the mechanism of the destruction posed by corrosives. Some corrosive chemicals are valued for various uses, the most common of which is in household cleaning agents. For example, most drain cleaners contain either acids or alkalis due to their capabilities of dissolving greases and proteins inside water pipes such as limescale. ↑ "Sulfuric acid – uses". Archived from the original on 2013-05-09. ↑ "International Chemical Safety Card for Chloramine-T". Cdc.gov. Retrieved 2013-07-07. ↑ "Drain and Waste systems cleaners".